Just saying the words makes you want to cringe, and puts visions/nightmares of whole outfit changes, crib bedding changes, middle-of-the-night baths, and thrown away strollers into your head. You've tried switching brands of diapers, up-sizing, cloth diapers, plastic diaper wraps and who knows what else, but nothing has been able to stop that dreaded poop explosion. Well, we can't say that we wrote the book on how to stop diaper blowouts, but we can say that we wrote the patent on it! Yes, the patented BabyBackups are the only product on the market that actually contain the mess and stop that soul-crushing up-the-back diaper blowout. 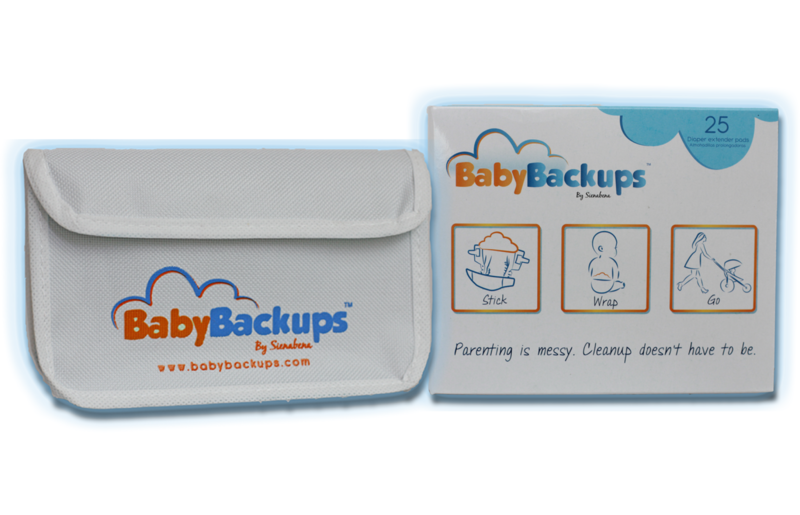 BabyBackups are hypoallergenic, disposable, and work with any brand of diaper (disposable or cloth) size 0-5. If you're ready to regain part of your sanity, simply click the "add to cart" below to purchase your BabyBackups now. If your not completely sleep-deprived yet, and would like to learn more about this wonderful product, please continue reading below. What a deal! You get a 25 pack of BabyBackups and a Travel bag, all for only $8! You can't afford not to buy this. BabyBackups stop up-the-back diaper blowouts, period! Anyone who has experienced a diaper blowout knows how awful it is to deal with, especially if it happens in the car or a public place. Cleanup may be as simple as changing your precious little one's diaper and clothes, or as extensive as buying a new outfit and steam cleaning everything around the epicenter of the incident. Either way, it's unpleasant and something that should be avoided if at all possible. BabyBackups are the best solution for keeping your number one priority’s "number two" exactly where it should be. While other products trap the mess between the baby's back and the product, BabyBackups eliminate messy cleanups and embarrassing situations by keeping liquid where it belongs, in the diaper. BabyBackups are a hypoallergenic diaper extender pad that can be used with any diaper brand, fitting snugly between the waistband of the diaper and the baby’s back. Simply peel off the adhesive strip cover, press the pad into the diaper, and secure the diaper around the baby. BabyBackups even include a blue alignment indicator to help ensure they are placed quickly and effectively to contain blowouts each and every time. Who (finally) came up with this great idea? Unlike diapers, BabyBackups weren’t developed by some giant corporation and they weren’t thought up as a marketing ploy. Instead, real parents took to the problem, fed up with diaper companies that couldn’t stay true to their word. Parents who tried brands big and small, who searched everywhere only to find solutions that trapped those stinky surprises against a child’s back making clean-up even messier. In the end, they realized there just wasn't a dependable diaper blowout solution. BabyBackups are the answer to this icky problem. They are the only diaper blowout prevention pad that actually stops blowouts. They fit within the diaper to contain the mess within the diaper. BabyBackups stop diaper blowouts, period.